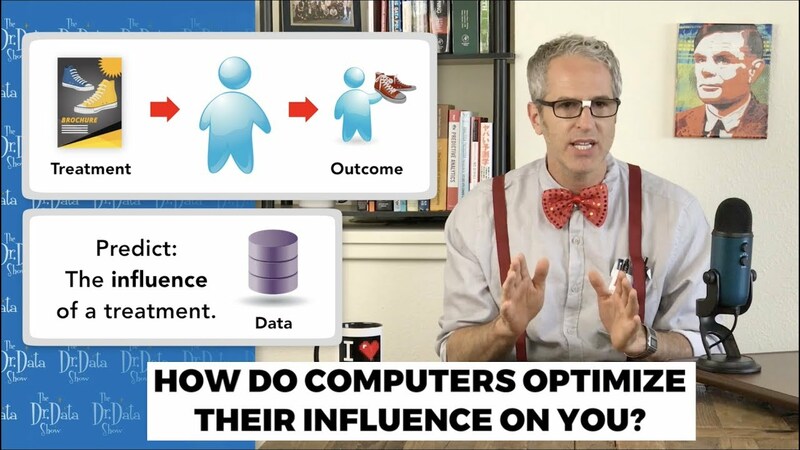 How do computers optimize mass persuasion – for marketing, presidential campaigns, and even healthcare? And why is there actually no data that directly records influence, considering it’s so important? In the season finale episode, Eric Siegel introduces machine learning methods designed to persuade. How do computers optimize mass persuasion — for marketing, presidential campaigns, and even healthcare? And why is there actually no data that directly records influence or persuasion, considering it’s so important? And what’s the ideal technique for optimizing your dating life and for getting more people to wash their hands in public restrooms? It’s time for Dr. Data’s persuasion paradox “Groundhog Day”-inspired geeksplanation. Let’s do this! I’m donning the full Dr. Data regalia because persuasion modeling requires a deep geek dive. But it’s as important as it is fascinating. Of all the things achieved by machine learning, the capability to predict is the Holy Grail for driving decisions in business, healthcare, law enforcement, and more. But predict what, exactly? Like, for targeting marketing, normally it predicts which customers will buy. Then you send, like, a brochure, to those people and only those people, the ones flagged as more likely to buy. But hold on, a company only want to spend $2 on a glossy sales brochure for consumers it’s likely to persuade. I mean, that’s the whole point of marketing: changing people’s minds. Influencing them. But if I mail everyone predicted to buy, I might be hitting many people who were gonna buy anyway. They don’t need to be persuaded, so it’s a wasted expense, not to mention more paper consumed, more trees cut down. After all, some products just sell themselves; they fly off the shelf even with little-to-no marketing. Ok, so I’ve just convinced myself to change my prediction goal. Instead of using machine learning to predict whether a customer will buy, we’ll predict whether they’d be influenced to buy if they see this brochure. That’s a very different thing to predict. Woah, that does seem like a great idea. It’s a big change from traditional data driven marketing… And it applies to healthcare, also! If we’re applying a healthcare treatment based on whose health is predicted to improve, we’re making the exactly same mistake as with marketing. ‘Cause, some patients are gonna improve even without treatment. If you take a pill and your headache stops, how do you know it wouldn’t have stopped anyway? And also what about predicting which patients may be hurt by a treatment, those it would actually make worse? It would be better not to treat them at all. So, instead of predicting, will the patient improve with this treatment, predict instead, will the patient improve ONLY with this treatment — and not improve otherwise? Will this treatment itself make a positive change? After all, marketing and healthcare are really quite similar. In both cases you wanna optimally decide who should get the treatment in order to improve the chances of a positive outcome. The whole point of these massive efforts — all the treatments applied across millions of individuals — is to improve outcomes. To have a positive effect on the world, a positive influence. And the best way to decide on a treatment is to predict whether it will have the desired effect on outcome. Ok, so it’s settled. We’ll use machine learning to generate predictive models that predict not the outcome per se, but instead will predict the influence a treatment would have, for each individual patient or customer. It’ll calculate how much more likely the positive outcome would be for this individual if we apply the treatment. Ok, great, so all we need is the right dataset for the machine to learn from. Let’s see… normally, we just use the results of a previous marketing campaign, since we’ve tracked who did and who did not buy. With these examples of buy and of not buy, it generates a predictive model that flags who’s likely to buy. So, in order to flag who’s likely to be influenced to buy, we just need examples of some people who were influenced to buy and others who weren’t influenced to buy. Uhhhhhh… but how can we tracked who was influenced? The only way to know someone was influenced would be if we knew that they would not have bought if we didn’t contact them, that our glossy brochure changed their mind. But we did contact them to find that out, so how could we know what would have happened if we didn’t?